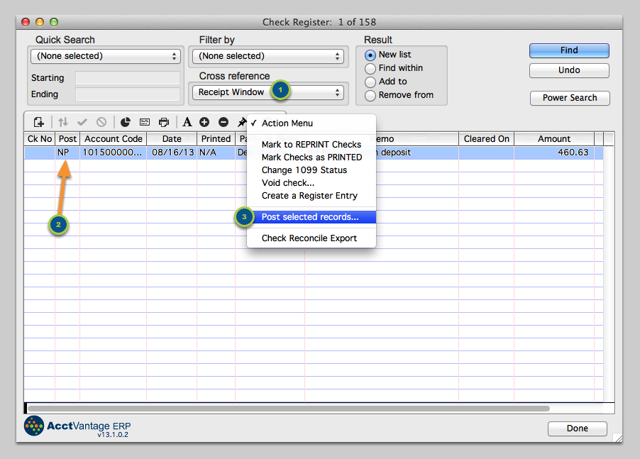 Bank Deposits are the method that AcctVantage ERP uses to recognize funds received on the Check Register. In order to Create a Bank Deposit, you will need to have received at least one Payment from a Client. If you have a Receipt linked to a Sales Order and you don't want to post the Sales Order yet, then you can still post the Receipt. The Receipt will be converted into a Client Deposit linked to the Sales Order. After a Receipt is added to a Bank Deposit, it is locked in read-only status. If you need to make changes to the record, you'll need to Void the Deposit. Neither the Receipt nor the Deposit can be posted if you want to modify the Receipt. 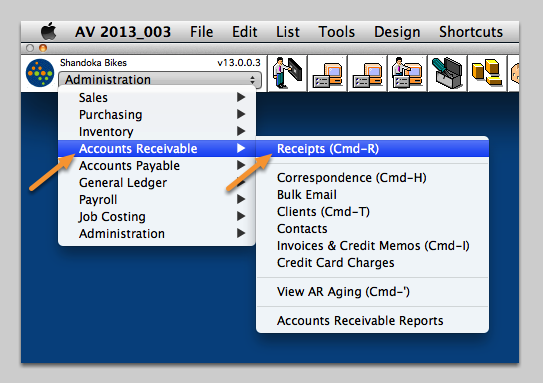 Navigate to the Accounts Receivable ➤ Receipts window. Highlight the Receipts to be deposited. Open the Action Menu and select Create bank deposit. 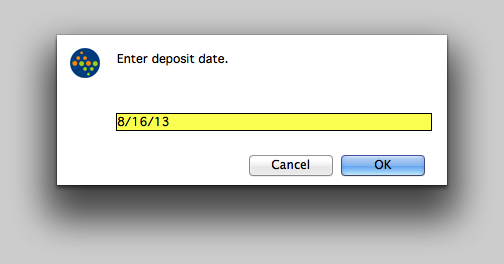 Enter the Deposit Date. This should be the date that will be on the bank statement. Cross-reference from the Receipt window to the Check Register. Highlight the the Non-posted (NP) Bank Deposit. 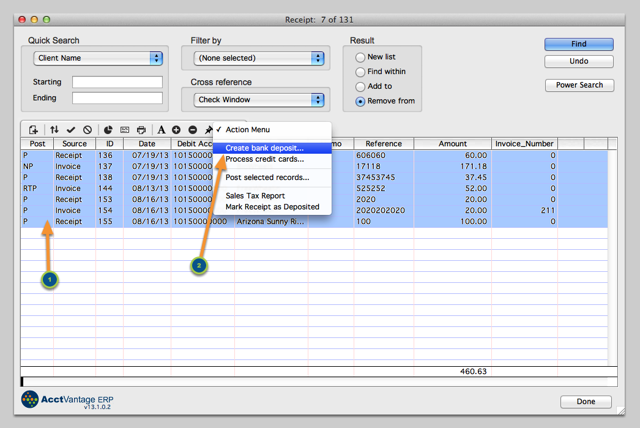 From the Action Menu select Post selected records (this action will post the bank deposit to the Check Register so it can be reconciled). ...DOES NOT affect the General Ledger. The General Ledger is charged upon the posting of each individual Receipt. ...DOES prevent any changes from being made to either the Deposit or the Receipts included within. If you think you may need to change a Receipt or Deposit, then don't post any of these records. 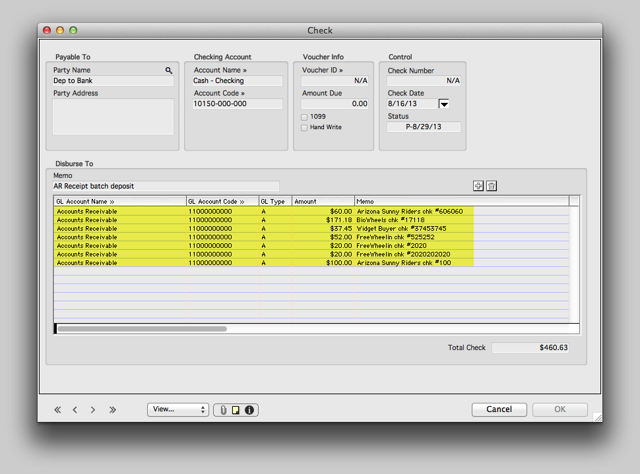 If you open the Bank Deposit in the Check Register you can see a listing of the individual Receipts that make up the deposit.